He devoted himself to asceticism, prayer and study and became a chosen vessel of the gifts of the Holy Spirit. His reputation spread quickly and the monks of the Sacred Monastery of Vicovaro asked him to be their abbot. The Saint gave in to their request, but soon he was forced to leave the Monastery, since those who elected him considered him too strict, so they slandered him and attempted to poison him. The Saint miraculously survived and returned to his beloved quietude. Later there gathered around him many disciples, who wanted to become monks under his inspired guidance. He received them and founded a Coenobium, in which he applied his monastic "rule". Here it is worth noting that the Saint called his Coenobium a "School" in which, as he said, "we are taught to serve the Lord". For better guidance of the monks he founded twelve small coenobitic Brotherhoods. Each one of these had a head and eleven other monks, but he was the spiritual father of all. Saint Benedict was slandered again and defamed by a certain priest. And to not create problems for his Brotherhoods and the monks he again departed into his beloved stillness, where he remained until the end of his earthly life (553-557). The end of his life was peaceful. He was forbearing, full of love, endowed with the gift of wonderworking and a continuous benefactor to all without discrimination. The venerable Gregory the Dialogist, in his book titled Dialogues, makes reference to the life and miracles of Benedict of Nursia. First, in the West they continue to honor the memory of the venerable Benedict and even the Pope, who resigned some time ago, took on the name of the Saint. However, although the venerable Benedict is honored in the West, his faith and teachings are underrated. This, of course, is an oxymoron, because it is not possible for one to say they honor a saint and at the same time not accept his teachings, which had a direct relation to his way of life, since faith is not a theoretical teaching, but a way of life. The ascent of the venerable Benedict to the heights of virtue and perfection took place through living the Orthodox faith, and this Orthodox faith of the venerable Benedict was given empirically to his disciples, leading them in the straight path of the commandments of Christ. And by this faith he was made worthy to work miracles and heal psychic and physical illnesses. Any alteration of this faith leads astray from the straight path of the commandments of Christ, as well as the loss of spiritual therapy and salvation. The Divine Chrysostom says characteristically: "To honor the saint is to imitate the saint." This means that whoever truly honors a saint, they will struggle to emulate their way of life, which is the practical application of his faith and his teachings. In other words, they must accept the faith of the saint and struggle to adapt their way of life in accordance with their own way of life, because in this way they will attain personal regeneration and salvation. Second, one of the characteristic features of the saints is that they are not unjust or quarrel with anyone. They develop their teachings by battling in their way of life, but they do not desire to impose it because they respect the freedom of others. They never use violence, and when others doubt them because they are beyond their comprehension, and they are banished, then they leave peacefully. It should be stressed at this point that the saints, namely true people, exist also today, as they will always exist at all times until the Second Coming of Christ. Indeed, many of them are not monks in coenobitic monasteries or ascetics in the wilderness, but some are also married and have families, living and moving among us, without being noticed by many, because their inner life is hidden "like Christ is in God", and also because the saints are understood only by the saints, who walk the same path and have the same experiences. Just as, for example, scientists are only understood by other scientists, painters by other painters, musicians by other musicians, etc, because they are in a position to understand and appreciate the knowledge and value of their work. Externally the saints are like other people, with daily occupations, sorrows and joys, temptations and problems. Internally however they are spiritual volcanoes, which when they erupt they scatter around them the lava of their love, which does not scorch, but cools, and the fiery river of their goodness, waters internally the souls of their fellow people, truly comforting and supporting them. Their existence is a real blessing for their family and social environment, as well as that of the entire universe. They have deep peace within them and for this reason they calm others. They do not create problems, but on the contrary by their discernment and patience they solve in the best way problems that occur daily. 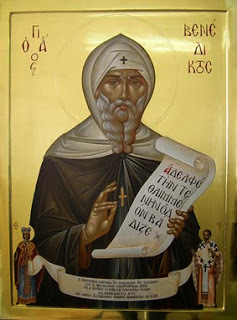 I would like to end with an exhortation of the Saint: "Rejoice when you suffer injustice, be glad in the implementation of the divine commandments, and feel as if every day you are giving an account for all things before the Judge." Source: Ekklesiastiki Paremvasi, "Όσιος Βενέδικτος", February 2013. Translated by John Sanidopoulos.